With an ever-increasing number of poets taking on research-demanding projects and spitting out books that obsess—beautifully—over their material, it is no surprise that our former U.S. Poet Laureate, Rita Dove, would attempt to do the same. However, to handle the material well, or obsess successfully, requires a careful pen—especially if the writer chooses to focus on a scantily glossed-over figure in music history. Dove takes on the challenge of lyrically narrating the ups and ultimate downs of the career of George Polgreen Bridgetower, a dark-skinned prodigy violinist who had his chance with Beethoven—and lost it. How she manages to take the many characters involved over the brief time period on which she focuses and use what is known of their experiences (and what is unknown—ah, the wonder of extrapolation!) to illuminate a marvel that sustains a two-hundred page manuscript manifests in what she knows: form, content, and music. 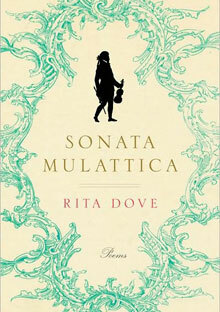 Sonata Mulattica, Dove’s thirteenth book to date, juggles many different people and places that all revolve around the short time in music history during which the young Bridgetower enchanted audiences with his violin. To help stabilize the reader, and to present the material as more than a mere history report, Dove experiments with form in several ways; she utilizes prologues and thematic sections, traditional as well as contemporary formal technique, and playwriting—which helps to explode the pivotal moment that halted Bridgetower’s career. The book opens with a preface that situates the reader in the historical context, while also claiming poetic license for all things imagined. This, perhaps, is crucial in establishing authority over the material so that the reader both believes and invests in Bridgetower, the real person, but also so that Dove is able to create her own world over which she presides, artistically. She follows up her preface with two prologues, which also have dual functions: to introduce the major elements of the book (which might have become lost or muddied had they not been shoved into the spotlight), and to remind the reader of the dramatic quality of her narrative lyric—a formal drama that begins with (two!) formal prologues. The first, entitled, “The Bridgetower”, ironically begins with an epigraph of dedication from 1803 by Beethoven, prior to his falling out with Bridgetower that ultimately shoved the young violinist back into the shadows. Originally, what we now know as the “Kreutzer Sonata” was intended for Bridgetower, and was supposed to be named after him, until he smooth-talked a barmaid Beethoven desired, sending him into an outrage. Dove begins the prologue, “If was at the Beginning” and continues on a rant of hypotheticals carefully chosen to illuminate what precisely is at stake for Bridgetower, and everything that subsequently goes wrong. By forcing the reader to consider the possibilities, she adds significant weight to her epigraph, which would have become a real dedication (“per il Mulatto Brischdauer, gran pazzo e compositore mulattico”) if Beethoven hadn’t changed it in his haste. The prologue does tremendous work to put the reader in the mindset of Rita Dove, herself—the mindset of begging questions and longing for different answers—precisely the kind of engagement a text so dense needs. The second prologue, quite properly described in its title as “the Rambling Sort,” draws the reader in even further with intricacies and charisma that are almost Shakespeareque. A careful reader can nearly see curtain rise. Dove leads the reader right into the first section of the book, “The Prodigy”, by employing more contemporary techniques of free verse, after such a formal and extensive introduction. She moves across the page in her imagining of Bridgetower’s childhood in the background of his father’s composing in the poem, “Recollection, Preempted”; “Woodland fairies beckoning / away / away / from the eternal drone / of the baryton– / meaning Papa Haydn / was out composing in the shed.” She uses a great deal of white space to create a childlike stream-of-consciousness, as well as the musicality inherent to the prodigy. This helps the reader to connect to the boy in such a way that, though he never achieved legacy status, his story becomes important. In later poems, such as “Disappearance”, Dove uses white space to enable another voice to speak—the voice of the stage director in this dramatic story. On the right side of the page, she begins the poem, “[Kill the lights. Cut the atmo. ]”, and then, moving back to left justification, “A boy and his violin: / That’s it.” By actually directing the lights and effects throughout the poem, she guides the inevitable emotional response of the reader, and still keeps the drama quality in the foreground. Dove doesn’t stray too far from traditional poetic form, however; throughout the book, she writes many poems in rhyme and meter, apparently to mimic the musical theme. “Ode to the Moon”, for example, appears in four rhyming quatrains, and several poems have refrains that help to create a familiar, yet almost chilling echo, such as “all men are beggars, white or black” in “Black Billy Waters, at His Pitch.” In many cases, she uses the repetition to make the underlying theme of racism resonate, without having to spell it out to the reader (which would only create an artificial resonance, anyway). In both the literal as well as the metaphorical center of the book, she inserts an original play about the argument between Bridgetower and Beethoven. By using this form, she is able to accomplish many aims; she slows time down, amplifies the tension by using real drama, and exercises vulgar dialogue that we all wish we could have heard Beethoven and Bridgetower use. The variety in form throughout the book helps to keep the material fresh, and allows the reader to approach it from different angles. While Dove’s use of form is one of her obvious strengths in Sonata Mulattica, she cannot rely on it solely to sustain the manuscript—the content must also be solid. The story itself compels, but the lasting quality the book exudes derives from the themes of humanity that anyone can understand. The reader witnesses a feud between friends over a love interest (involving a celebrity, at that), and the protagonist experiences luxury on the brink of fame—before losing his chance and never quite achieving the status he deserves, essentially because of his race. While classic themes often border cliché, Dove does not come close, mainly because she does not attempt to highlight them, or explain them—they are just there, innate and inevitable. The falling out between Beethoven and Bridgetower, placed at the center of the book not only because of chronology, but also because of its significance, serves—oddly—as comic relief. When Beethoven becomes incensed, he declares that he “would sooner dedicate [his] music to a barnyard mule”, and then rips up the dedication of his Sonata. This should be no laughing matter, and yet, the entire play is filled with witty insults and retorts, obviously designed to evoke laughter. In this way, Dove shows how, even in the midst of amusement, one simple argument can become a central issue, and quickly change a person’s fate. Because there comes a time. Because there was a time. Because Haydn came from there; came, and went back. Because I am no longer a Wunderkind. The repetition Dove uses not only builds tension through emphasis, but calls attention, once again, to the many questions that seem to have no answers, and the longing both she and Bridgetower experience. The poem echoes throughout the book, particularly after he ruins his chance to work with Beethoven. While Dove has obvious control over form and content in Sonata Mulattica, in the end, she wins her reader over with music, and not the music of Bridgetower or Beethoven. She is known for her lyrical musicality in her previous books of poetry, and in this one, it works even more fluidly because of the form and content. Not only does her style have music, but her lyrical meditations on music itself encompass musical qualities—sometimes without even having to rely on sound at all. Still, the musicality she employs never overwhelms—it is always just enough allure. In “Friedrich Augustus Bridgetower Discovers the Purpose of Fatherhood”, Dove makes use of her musical style with simple onomatopoeia and descriptions of the “tiny sounds” the young prodigy notices before his talent is even discovered: “purring bees and crickets, sighing leaves, / hammer clack from the courtyard” (Dove 30). She is able to articulate the sounds with specificity, yet with ease, making them more believable. In a later poem, entitled “The Lesson: Adagio”, she uses sensual sounds and white space across the page to convey Bridgetower’s relationship to his violin: “deep inside / a wounded angel’s / wing throbs & you / must find it: / probe / touch / heal / In / & / out, / like breathing.” The words appearing in singularity calls attention to the precision of each movement of the bow across the neck of the violin, slowly, as well as the smooth style for which Dove is widely known. From the beginning of the collection, Dove makes clear that she intends to lyrically meditate on music, itself. Even in the “Prologue of the Rambling Sort”, she boldly declares, “This is a story / about music and what it does to those / who make it, whom it enslaves”, so that for the duration of the book, music and torment are in close proximity of one another. Even in some of the simpler poems of Bridgetower’s childhood, the anguish he feels surfaces. “Lines Whispered to a Pillow” (a title that suggests solitude and a need for consolation) gives off the same vibe, particularly in the context of the prologue’s explanation. Watch me hear you, feel me think. While it is generally accepted as normal for children to talk to animals, and notice subtle noises, the “ticking clock” suggests loneliness—a yearning for time to pass, and the onomatopoetic “piano plink” casts an eerie shadow on the tone of the poem. The striking question and command create a sense of urgency, as would be expected from such a prodigy who understands music on an emotional level. As Bridgetower rises to the peak of his career, he becomes even more in-tune with “music and what it does to those / who make it”; in “Polgreen, Sight-Reading”, he explains that playing slowly is “more than stretching / a line—suspension is / what we yearn for.” Not only do these lines resonate on an emotional level because of his connection to music and the human experience of longing, but the enjambment allows for it to read as a description of lines of poetry, a double-entendre all readers of poetry appreciate. Dove impresses her audience with her lyrical style, both in musicality and meditation, but she also knows just when to pull back, so as to not spoil the poetry. In “Recollection, Preempted”, Bridgetower describes, rather whimsically, how he would play near his father, who was a composer. Before the reader can become overwhelmed with “the witchery of orchestral strings— / the full body of sound gathering in, as to a mother’s bosom / or a haystack at sunset, to plunge into / that stinging embrace” he interjects with almost humorous explanations in plain language: “(I was caught listening / and given a toy violin).” Dove’s ability to push the sound as far as it can go before going too far makes for an eloquent, yet attainable read. Sonata Mulattica, a huge accomplishment for one of our most acclaimed poets, works on many levels to give George Polgreen Bridgetower his due credit as a gifted violinist, particularly in the ways in which Dove handles form, content, and music. Had she not taken such care in these delicate elements, the forms would have felt contrived, the content cliché, and the music—a crutch. However, she took great care to weave the many threads throughout this intricately designed lyric narrative, this illumination of marvel, this successful obsession. Jillian Wriston’s poetry chapbook, South, was published by Finishing Line Press in 2010, and her poetry has recently appeared in Birmingham Arts Review, Iguana Review and Ekakshara. She received her MFA from Kent State University, where she currently teaches creative writing and composition.